Dissolving blood clot. Illustration of a human blood clot (thrombus) in the process of dissolving. 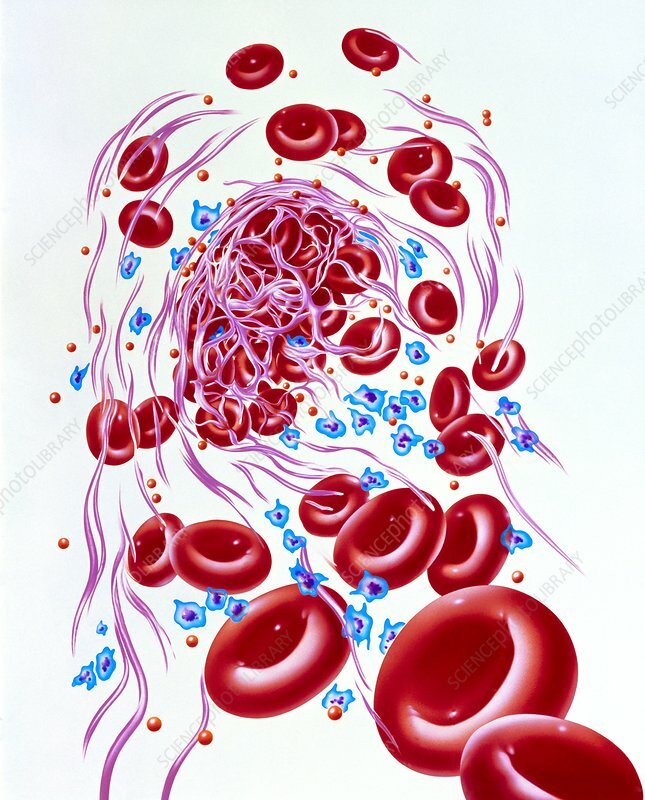 At upper centre is the blood clot, which consists of an accumulation of red blood cells (erythrocytes), a web of fibrin strands (pink) and platelets (blue). As the clot dissolves the fibrin web unravels and red blood cells and platelets escape. Activated platelets develop star-shaped processes (seen here) in order to perform the clotting process. Fibrin strands are an insoluble protein which act to capture red blood cells and prevent blood loss. The blood has both clotting and anti-clotting mechanisms, while various anti-coagulant drugs dissolve clots.